A gigantic 19th century Chinese archaic poem scroll painting – 24 feet wide by 29 inches tall – sailed past its estimate of $800-$1,200 to command $72,500 at Bruneau & Co. Auctioneers’ March 3rd Antiques, Fine Art & Asian Arts auction. Press Release (ePRNews.com) - Cranston, R.I. - Mar 16, 2018 - A gigantic 19th century Chinese archaic poem scroll painting – 24 feet wide by 29 inches tall – sailed past its estimate of $800-$1,200 to command $72,500 at Bruneau & Co. Auctioneers’ March 3rd Antiques, Fine Art & Asian Arts auction, held online and at the firm’s Cranston gallery. The buyer was an in-house Asian bidder acting as a broker for overseas buyers. About 18 feet of the scroll’s 24-foot image area comprised the painted landscape. Other features included several chops and collection seals along the borders of bold calligraphy. Some creasing and foxing on the paper didn’t deter bidders, who were evidently able to decipher the name of the artist, whereas Bruneau & Co. declined to weigh in. That accounted for the modest estimate. The auction was highlighted by the gorgeous Asian antiques in Part 2 of the George Dagher collection of Chinese Export and the Ruth Latta collection of Japanese scrolls. The auction also featured a broad selection of original artworks by well-known American artists from different stylistic periods, as well as a tantalizing selection of fine antiques, furniture and decorative arts. He was referring to the Austro-Hungarian silver and ivory tea set with an 18-inch diameter tray, a teapot (11 inches from handle to spout) and a sugar bowl, for an overall total weight of 89 ozt. The set, of whimsical form and fine craftsmanship, was marked with a Pest, Hungary assayer’s mark, an “MMM” lamp maker’s mark and an 1867-1872 date mark. It hammered for $5,000. Following are additional highlights from the auction, which attracted 75 people to the gallery, 32 phone bids, 192 absentee bids and 3,376 bidders participating online, via LiveAuctioneers.com, Bidlive.Bruneauandco.com, Invaluable.com and Bidsquare.com. The total gross for the sale was $212,850. All prices quoted in this release, to include the gross, include the buyer’s premium. 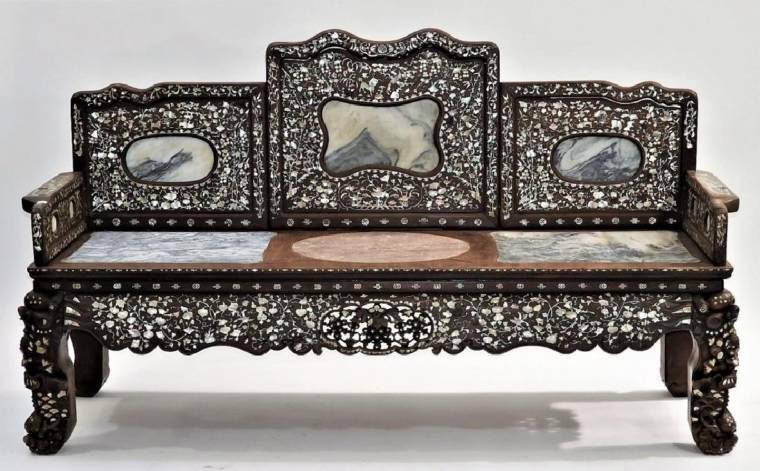 A lovely 19th century Chinese rosewood and mother of pearl inlaid and marble inset bench went to a determined bidder for $5,625. The 77-inch-wide bench was intricately inlaid with an allover floral tendril and animal pattern and stood on robust figural mythical beast legs. It was inset with mountainous dream marble and center rouge marble plaques and was in great overall condition. A pair of French Sevres-style, brass-mounted porcelain urns – palatial at 55 inches tall – finished at $3,750. The mid-20th century urns were signed “N. Nerini” and were nicely decorated with individualized scenic genre courting scenes. The reverse had mountainous waterfront landscapes. An 18th century oil on canvas Old Master painting of Christ, signed on verso (possibly “Carlo” but listed in the auction catalog as artist unknown), brought $3,438. The painting, 19 ¾ inches by 16 inches, had some minor craquelure and surface issues but was in overall good condition. A fine Chinese porcelain dragon vase from the Guangxu period, 11 ¾ inches tall, commanded $2,812. The gilt and enamel decorated porcelain vase depicted a scrolling scene of a dragon chasing a phoenix, with attached figural dragon handles, a celadon glaze inside and a six-character mark to the underside. It had some repairs that were virtually impossible to detect. A Tiffany & Company bronze repeater carriage clock, made in France in the 19th century and in fine working order, rose to $2,125. The gilt bronze neoclassical repeater carriage clock had a bronze dial signed “Tiffany & Co.”, beveled glass and a 5 ¾ inch by 4 inch by 3 ½ inch case. A watercolor on paper secessionist painting by Mildred Bailey Carpenter (Mo., 1894-1985), titled Well Dressed Woman in the Woods, 20 inches by 25 inches in the frame, topped out at $2,000. The painting was artist signed lower right and had gallery paper remnants on verso. A 19th century European wall sconce lit up the room for $2,000. The gilt bronze electrified acanthus wall sconce had figural Pan and Nymph head supports, an overflowing fruit and flower topper and bottom finial. With the extended candle holders, the overall height was 23 inches. A pair of Persian Iznik earthenware turquoise glazed vases from the early 20th century knocked down for $1,250. The vases, sold as a single lot, were ovoid shaped and were decorated with fish and florals. Each one was 11 ½ inches tall and was in good condition, with some minor flecking. To learn more about Bruneau & Co. Auctioneers, visit www.bruneauandco.com. To contact Bruneau & Co. via e-mail, use info@bruneauandco.com. Their phone number is 401-533-9980.